Dezeen promotion: students at the Southern California Institute of Architecture have suggested ways to transform a former jail in Los Angeles, including a park controlled by artificial intelligence and building models designed by 3D printers. The schemes were designed by the first graduates of LA-based SCI-Arc's Master of Science in Architectural Technologies – a one-year-long postgraduate degree that launched last year to teach ways to address critical issues in architecture with cutting-edge technology. Created in the third and final studio – titled Distortions and Alterations of the Real – the schemes use robotic automation and artificial intelligence to develop a way to adapt the city's Lincoln Heights Jail. The facility closed as a prison in 1965 and has since been used as a theatre, and then a set for horror films and music videos. Project leaders Marcelo Spina and Casey Rehm chose the historic jail, rumoured to be haunted, for its prominent location near to the Los Angeles River, providing plenty of scope for redevelopment. The site is also not far from the school. With access to five robots, a drone, a light detection and ranging scanner (LIDAR), and artificial intelligence, the students first made studies of the building at North Avenue 19 and its surrounding area, and then developed proposals to adapt the structure. Among the most dramatic ideas is a scheme by Sanhita Vartak and Burcin Nalinci. 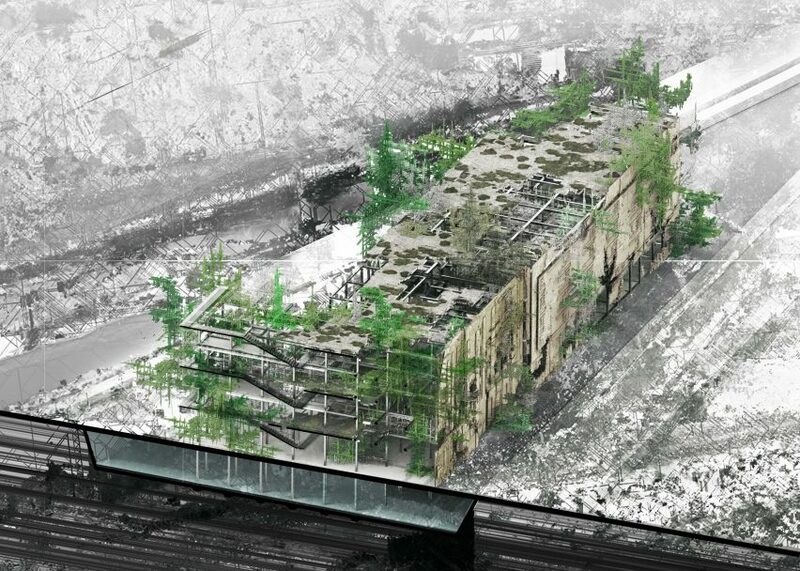 Titled Biophilia, it imagines populating the entire site with a "self-growing" park. The growth of the greenery would be controlled by artificial intelligence to create something between "the rainforest and the luxury of the garden mall". Parasitic modules would cover the entire historic building in Daniel Horowitz and Jose Mejias' Crypto-Architecture. Aiming to address the lack of affordable housing in the city, the design is intended as a new type of housing that integrates residences with data centres and energy-production programmes. For The Aesthetics of Digital Craftsmanship, Arsenios Zachariadis and Hsiao Chiao Peng took 2D drawings of the current building and scanned them through a 3D printer to create models of new forms. The Master of Science in Architectural Technologies is one of the four postgraduate programmes offered at the SCI-Arc EDGE, Center for Advanced Studies in Architecture, which focuses on architecture for the 21st century.